Breaking Barriers turns the job seeker event upside down! Instead of employers exhibiting their organizations, this event will empower women to break down the business practices that are creating inequities for women job seekers and to speak about their strengths as potential employees. 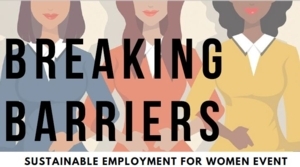 This event will feature a roundtable of women who will discuss barriers they’ve faced to achieving sustainable employment and will propose strategies and potential solutions for those barriers. We encourage employers to participate who are seeking to create practices that minimize barriers to employment and/or those who are searching for new talent for their organizations. What: In honor of Women’s History Month, the Business Resource and Innovation Center is hosting an innovative and inclusive job seeker event in partnership with Strategy Arts and WOMEN’S WAY. Registration is requested. Click here for more information and to register. Wednesday, March 27 | 5:30 p.m to 8:15 p.m.